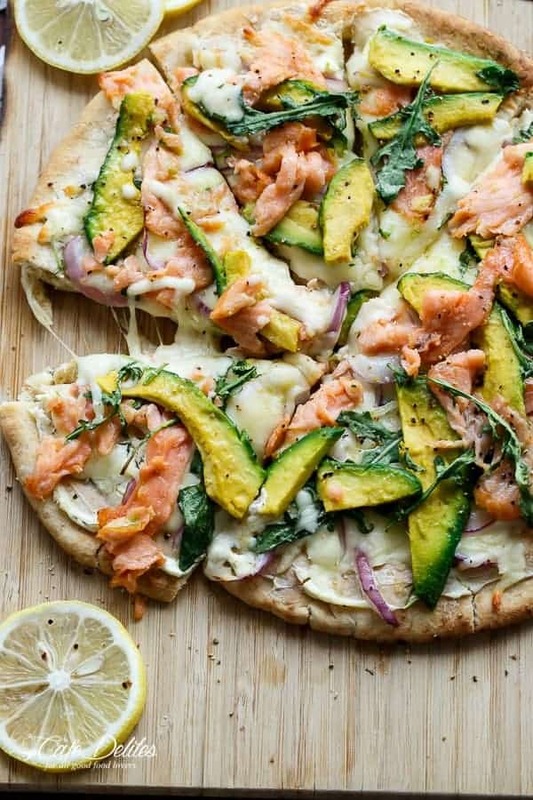 Smoked Salmon and Avocado Pizza with a herb cream cheese base and peppery arugula leaves. It occurred to me in a disturbing way that I’m always sharing pizza type recipes, like the Barbecue Chicken Pizza Pull Apart Bread and that Pizzadilla…or the Cheesy Pizza Pull Apart Bread. Then there were those Margarita Pizza Stuffed Chicken Breasts that were kinda pizza-genius. but there is not one single pizza recipe on my blog. 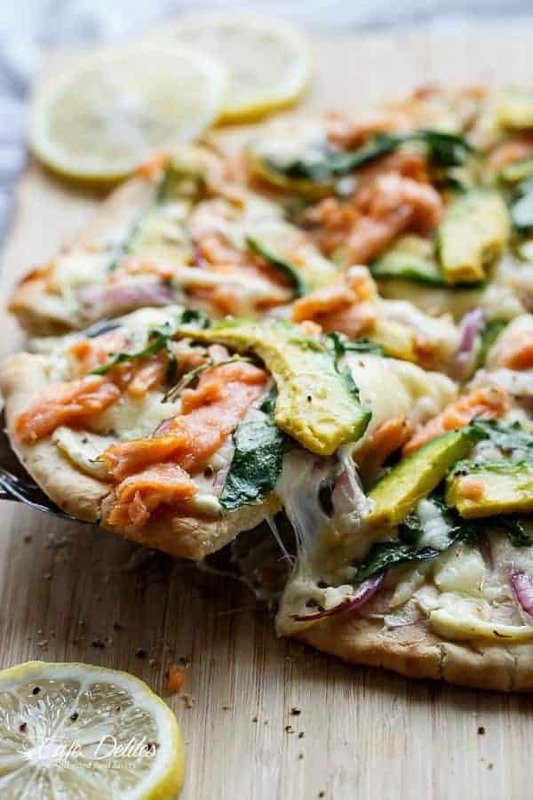 So cheesy and full of healthy good-for-you-stuff, this pizza is incredible. After making the Smoked Salmon And Avocado Grilled Cheese, you’ve been asking for more of the same flavour combination! Well. This was it. Perfect for breakfast, lunch or dinner. 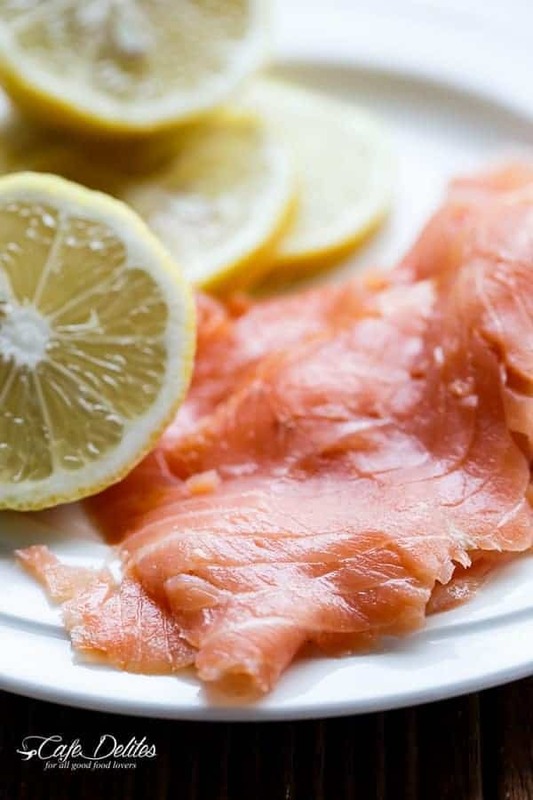 Fresh smoked salmon slices drizzled with a little lemon juice. A wholemeal/wholewheat pizza base or a flour tortilla….already made and perfect for throwing whatever toppings your heart desires…drizzled with a little garlic olive oil. 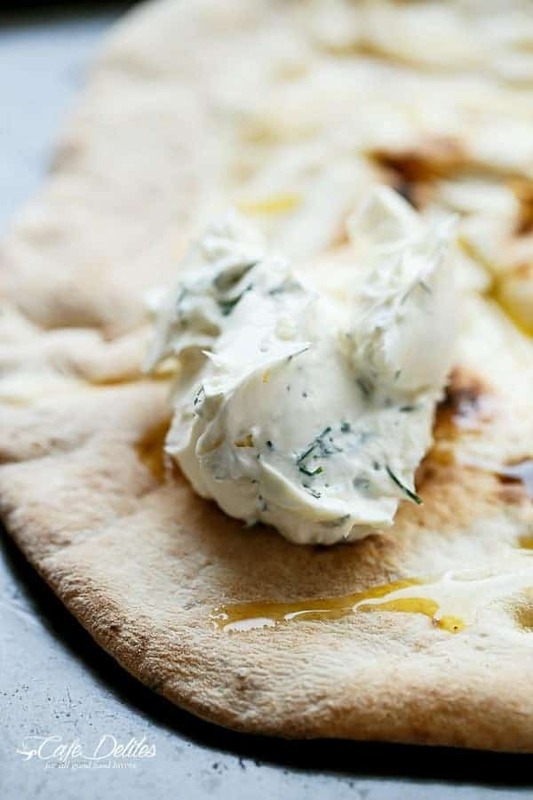 The perfect cream cheese mixture with garlic and dill spread onto a pizza base. Topped with onion rings and cheese and finally topped with the smoked salmon, avocado and fresh rocket/arugula leaves. With a shake or 7 of lemon pepper and a drizzle of lemon juice, this pizza went like crazy. At this point…you can serve how it is! Sprinkle a little extra cheese over the top and place back into the oven for extra melty cheese and warmed through avocado and salmon. The choice is yours. Preheat oven to 200C | 390F. In a small bowl, combine the cream cheese with the dill and the crushed garlic. Mix well. Drizzle the olive oil onto the pizza base and spread with the cream cheese mixture. Top with the onion rings and the mozzarella cheese and bake in the oven for 10 minutes or until the mozzarella has melted through. 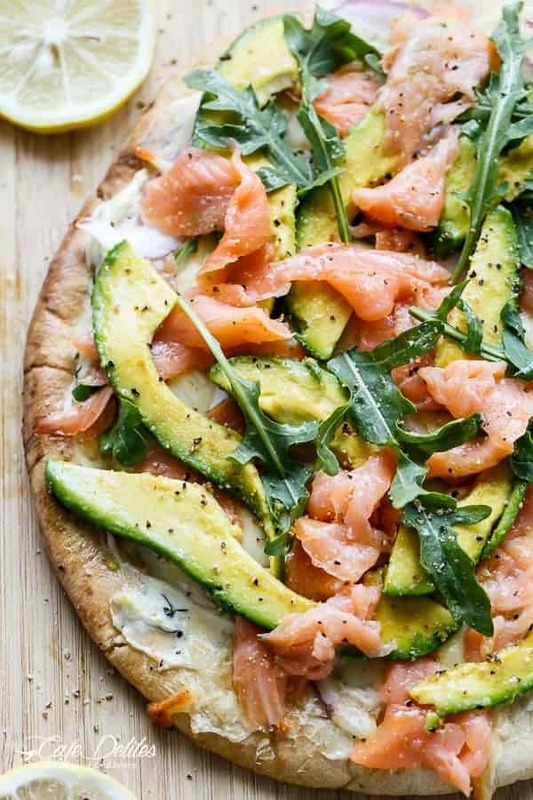 Remove from oven; top with the salmon slices, avocado slices and rocket/arugula leaves. Sprinkle with lemon pepper and serve, or top with the (extra) cheese and place back into the oven to warm the avocado and salmon through. Its the bomb! I’ve made it a few times now and its one of the best combination of flavors I’ve ever tasted. Love this – the recipe and your attitude! Thank you! Hi! I just want to tell you that I made this today & it was REALLY good! So yummy!!!! A must try if you love a creamy garlic/dill taste with delicious smoked salmon. I ate half the pizza! Karina greetings from Poland ! 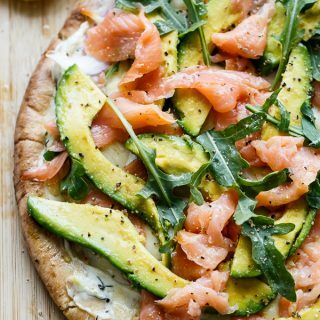 SMOKED SALMON AND AVOCADO PIZZA this is it 🙂 My family love it!!!!! Thank You. Aw I’m so happy to hear this Slawomir! Thank you so much for letting me know! Karina! This is lovely!!! Absolutely gorgeous dish doll!! !